Kingston Technology Company , Inc., the independent world leader in memory products has introduced Kingston DataTraveler Mini with Migo. 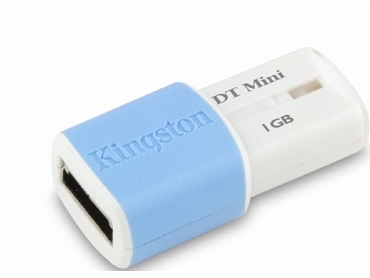 As the new addition to Kingston’s family of miniature USB Flash drives, the DataTraveler Mini with Migo uses the powerful Migo Software, Inc. technology to give consumers the ability to seamlessly transform any PC into their personalised workspace, making it one of the convenient, customisable multifunction USB drives on the market. According to Kingston Technology, the growing popularity of USB Flash drives makes them a must-have among students, consumers and even single-computer families. The new DataTraveler Mini with Migo is an ultra-small personal storage device with character. DataTraveler Mini with Migo easily attaches to a keychain or can be strung on a cord. DataTraveler Mini with Migo’s the perfect device for swapping and storing personal files such as photos, homework or even e-mail messages. Measuring 0.70 x 1.42 x 0.40 inches (17.85mm x 36mm x 10.24mm), the new DataTraveler Mini with Migo is a colourful alternative to traditional USB drives. Available in three colors, varying by capacity, the DataTraveler Mini with Migo is available in red for the 512MB, light blue for the 1GB and light purple for the 2GB version. A sliding retractable USB connector, or capless design, eliminates the possibility of losing the cover during transport. First to offer Migo technology with the DataTraveler II Plus - Migo USB drive in July 2005, the DataTraveler Mini with Migo automatically synchronises data, keeps versions current and leaves no trace of personal data on other systems, giving consumers the freedom to work safely on multiple PCs. The DataTraveler Mini with Migo supports e-mail clients Microsoft Outlook Express 5.0 and above, plus Mozilla Thunderbird 1.5.0.5 and above. Microsoft Internet Explorer settings, favorites, cookies and history can be captured and stored on the drive. Once re-connected with any previously synchronised computer, DataTraveler Mini with Migo automatically synchronises and updates where necessary. Browser support includes Microsoft Internet Explorer version 5.0 and above, plus Mozilla Firefox 1.5 and above. The 512MB and 1GB capacity DataTraveler Mini with Migo are available now at leading retailers, major online sites and at www.kingston.com. The 2GB capacity will be available mid-February. All Kingston USB drives are backed service and support.